Sometimes I feel like I dropped down the rabbit hole and what was once wrong, is now so right. 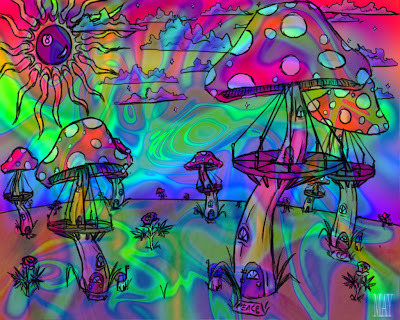 I’m speaking of psilocybin, magic mushrooms if you will. Back in the day, eating shrooms was a mystical experience you took with friends. When Jimi Hendrix asked, “Are you experienced?” he wanted to know if you ever dropped acid. But the “Man” said it was wrong. This is the coolest version I’ve seen yet. Disney characters (like Alice) move with the words of the song White Rabbit. Take a look and listen. Now in the 21st century, those “mind-expanding” drugs we loved so much in the 1960s, are back and researchers are telling us it’s a good idea to take them for depression. Hmmmmmmm…..blitzed out Baby Boomers eh? I think it’s a conspiracy to keep old hippies from causing any political trouble today! Seriously though, walking around feeling strange doesn’t seem like the best way to cure depression. What the hell do I know anyway? In the interest of fairness, I‘d like to hear your views about taking really stony drugs to treat depression. Is it just me, or doesn’t Big Pharma already have a lock on that market? “The brains of people tripping on magic mushrooms have given the best picture yet of how psychedelic drugs work and British scientists say the findings suggest such drugs could be used to treat depression. Two separate studies into the effects of psilocybin, the active ingredient in magic mushrooms, showed that contrary to scie ntists' expectations, it does not increase but rather suppresses activity in areas of the brain that are also dampened with other anti-depressant treatments. These so-called "hub" regions of the brain are known to play a role in constraining our experience of the world and keeping it orderly, he said. "We now know that deactivating these regions leads to a state in which the world is experienced as strange." Read more here. A second study is due to be published in the British Journal of Psychiatry on Thursday.